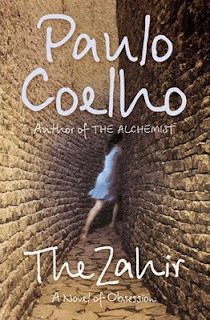 I've seen Paulo Coelho's books at the bookshop before but it wasn't until recently that I grew the urge to pick one up. From what I had heard about his books (and gathered from their placing on the spirituality bookshelf), they were thought provoking, somewhat life affirming reads that had the potential to stick in the minds of readers long after closing the pages. And I, being interested in that sort of thing, thought it was about time that I gave his work a try. 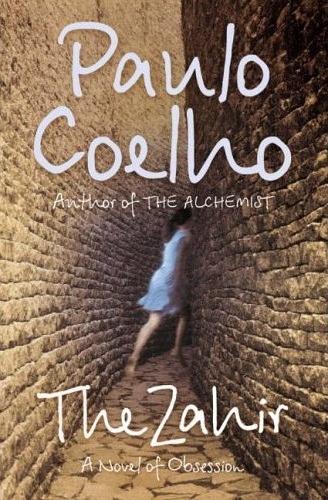 I found The Zahir in the regular fiction section of the library, so I assumed that it would just be a regular old story with no hidden message, no lessons like Coelho's other books are supposed to contain. But, I was wrong! Along the way, the narrator introduces us to some wise metaphors, symbolism, and analogies that are uncovered as the story unfolds. Some of them are really not straightforward at all; some of them I found myself having to think about for a little while to understand, others I picked up more quickly, and some I even felt the need to write down so that I could remember and perhaps use them later on. The idea of The Zahir to get the reader to think, perhaps to encourage them to reassess the way they think about themselves, their life and the people in it, just as the narrator of the book is doing throughout. So, even though it took me a while to read, I enjoyed The Zahir. I loved the refreshing spiritual elements, the lessons and the messages that it contains; even though at times I found there were so many to keep up with that it became momentarily mind-blowing! I'd recommend this book to those who are interested in spirituality and alternative thinking.